Thanks, as always for clicking in. It is your comments and suggestions that have kept me at this for several years and for 99 postings. Without your input this would not be worth doing. I respond to all comments. So I am looking forward to seeing what you have to say. This view is inside the bottomless box. Note the rounded inside edges to help slide it over the Kleenex box. Story: A friend needed a number of Kleenex covers to serve as gifts for a wedding party and for presents at a retirement celebration. So we are talking about being able to crank out about 15 of these covers without too much thinking or fuss. 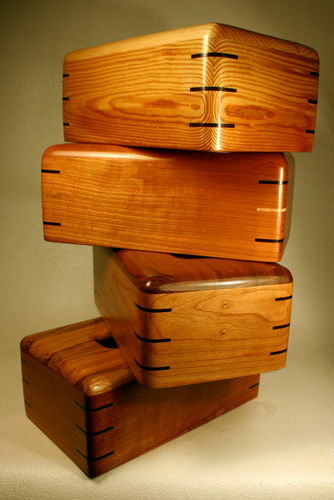 As it turns out this is a great project for friends who come to the shop to learn about making boxes. A Kleenex cover has most of the same skills as building a box, but it doesn’t involve inserting the bottom board and installing a hinge. Those can be difficult skills to master. This cover is also made to fit a set size so there is no design stage. Easy peasy right? Problem: Well, it would be easy peasy if it weren’t for the need to make the slot in the top in exactly the right place. If the slot is a little to one side or at a slight angle it looks really bad. To make things worse if you cut the slot first and glue the top board on it will always scoot around a bit when you put it in the press. So, there is no way to put the slot in the top and then attach it to the four-sided base. What to do? Solution: As always in woodworking the solution to accuracy and repeat-ability is to make a jig…so I did. In fact I made two jigs. 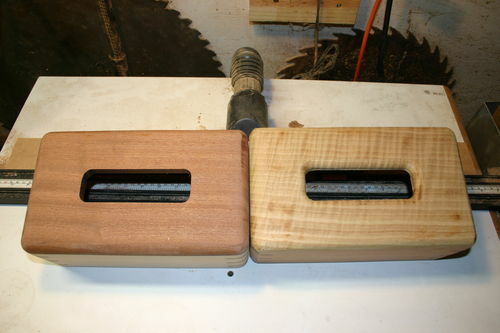 One helps drill two holes in the top, the other helps cut out the slot in the center. 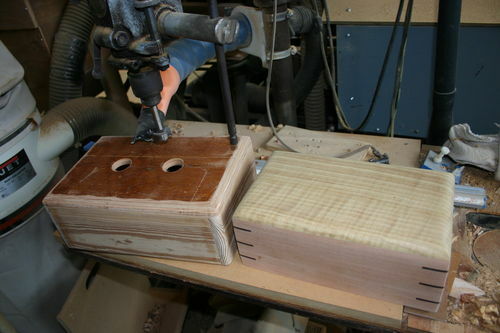 The hole jig slips over top of the smoothed box and lets you drill the two holes accurately. So you have two holes and you cut between them with a jig saw to remove the bulk of the wood from the slot. Now for the second jig in the solution. This one goes INSIDE the box. It forms the shape of the slot. The base is two long and two short pieces of MDF glued together. The corners have been clipped and the edges rounded. 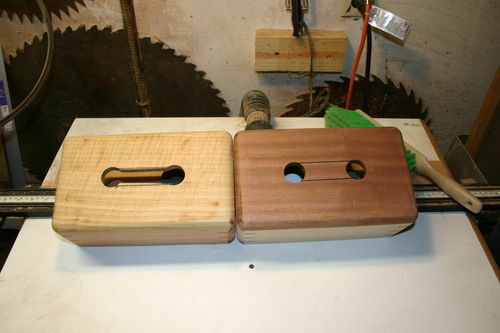 The “handles” and holes make it easy to put the jig into and out of the Kleenex cover. 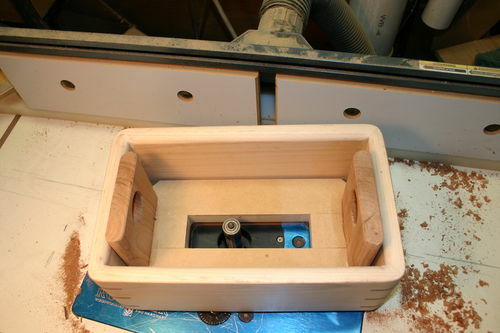 This jig acts as a guide for the pattern router. The bearing on the bit rolls along the jig sides. It fits upside down in the box. 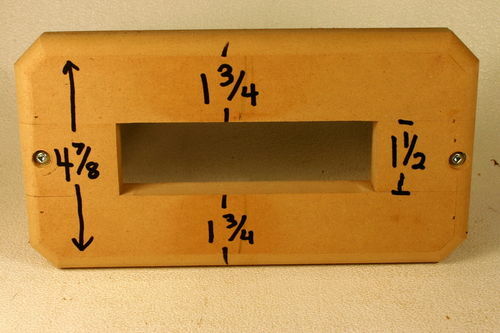 This jig gives you an accurately placed slot or hole in the top of the box. The slot is the right size and in the right place every time. After routing the slot with a 1/2” roundover bit it looks like the top on the right. 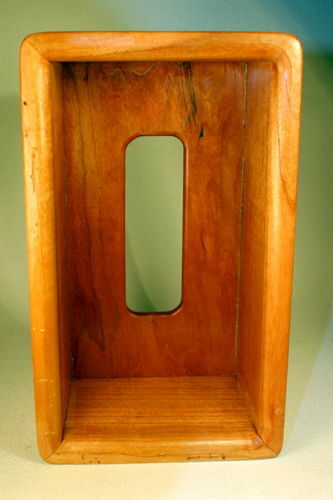 Bonus: If you have been very accurate in all your measurements and have said all your prayers and luck is on your side, you can round off the bottom of the slot using a small router. It works for me, but it is a close fit. I use a roundover bit with a bearing that follows the bottom of the slot outline. This routing is a real time saver since you don’t have to hand sand the underside very much. The slot really doesn’t look or feel right without some hand sanding around the slot to remove all the machine marks and soften the edges so they look right and feel right to your fingers. 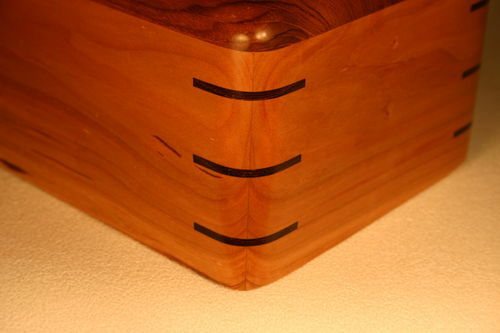 Hints: Make your jig a 1/8” or so narrower than inside your box. 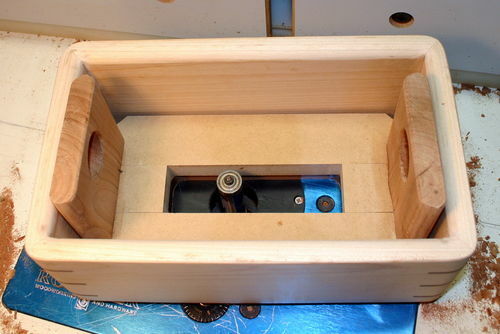 The jig slides into the box more easily and you can adjust the jig to any slight imperfections in your cover. Clipping the edges means you are not fighting glue squeeze-out. Be sure the sides of your cover are 5/8” thick. Otherwise these dimensions will not work. You need to increase the size of the sides and ends if you use 3/4” material. 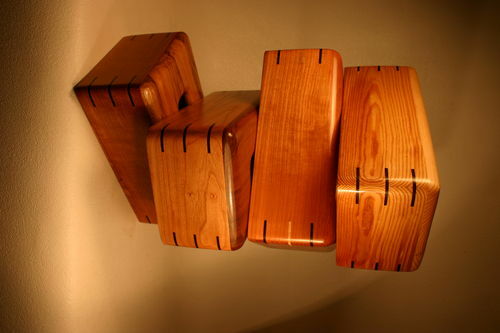 This project is a great way to use up those narrow boards that won’t quite make a box. The sides are just 3 3/4” wide and the sides are 10 1/2” and 6 1/4” long. 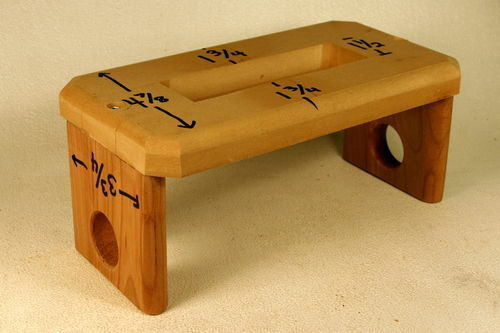 So, you can make one of these with a board that is 5/8” x 3 3/4” x 34 1/2”. That length includes an extra inch for squaring and cutting the board into lengths. Great work as always, BG. Practical and elegant. Very nice looking tissue boxes Al. I like how that jig inserted into the box gives the router bit bearing a place to ride on a great idea! Doug, thanks for the kind words. Elegant is a word I am more likely to apply to your work. IL especially liked your lap desk. Tony, thanks. Jigs are great when they work. It took a couple of tries to get this design to work like I wanted it to. I liked your candy dispenser. It is a fun design. Ralbuck, thanks for the YUP. I liked seeing the toys you made. Brilliant and beautiful, Al. Also, in my Faves folder. Captain Ferd, thanks for the high praise. Good tip on getting dents out of wood projects. Mark Wilson, thanks for the nice compliment. 100 postings is quite an accomplishment. Doc, I actually made a first box that fit the smaller sized Kleenex box that I had in the shop. Then I went to the store and found that now the only way to use it was to adapt the new larger Kleenex box to my old box size, so I re-designed this pattern to fit the new size. That is the problem with growing older. The kids that are in charge now keep changing the world while we are not looking. I suppose we did the same thing to our elders. Awesome work, Boxguy. Looks like a out of the box box idea ;-) Congrats on Top 3! Super cool Al. Thanks for sharing the picture of the jig and it being used on the TS. At first I thought it would go over the box and then hand route the slot, but it makes much more sense to do it on a router table… Much more control that way. 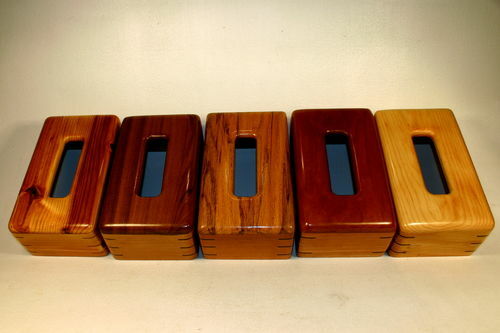 Al, many years ago my father made tissue box covers, his were nice but yours are so sleek and pretty. Thanks for sharing and for making these beautiful tissue box covers. Toppa, always nice to hear from you again. The jigs are actually over the box and inside the box ideas, but they do seem to qualify as out of the box thinking. Might be time for some new postings from you if you can. Tooch, thanks for the insightful comment. I didn’t think about another over-the-box jig, but that would work. I have seven routers of varied sizes and shapes all mounted on “tables” as simple as a board with a router screwed underneath. I hate the long set-up time that it takes to use a non-mounted router. With all those routers I can just walk up to the tool and use it. 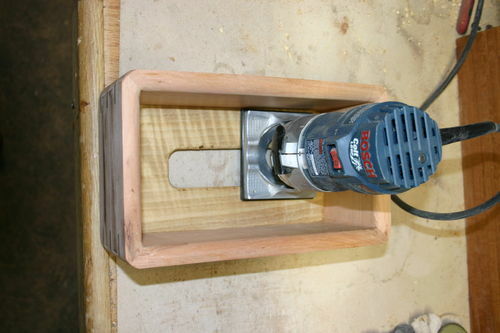 The only free-hand router I have now is that small Bosch Colt that I used here. As you pointed out, the internal jig has the added advantage of control, but I can also see what I am doing when I use it. Chuck, what a nice comment. The attached lids are a little more trouble and have wood movement working against them, but I can’t resist the look and feel of them. 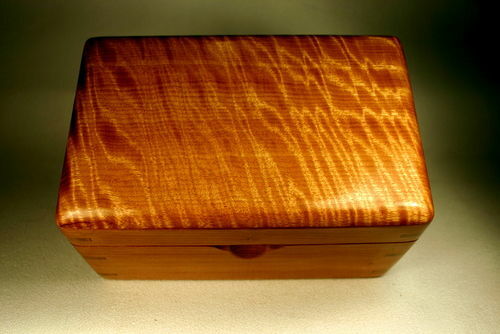 I love the way the grain in the lid wraps around the sides and the ends. Al these are really nice. They would make great gifts. 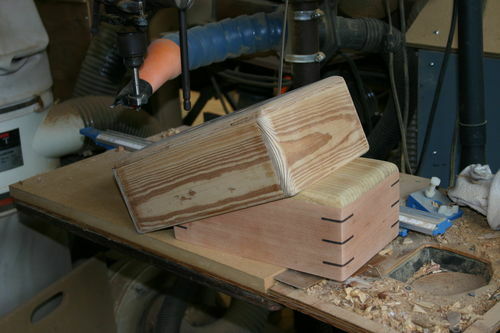 Over the years I have found that the use of jigs is an important part of wood working. Wow! 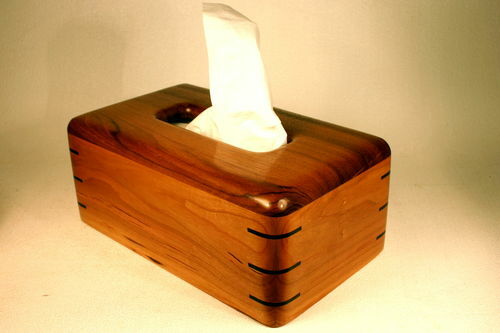 What a beautiful tissue box. Al, this is so outstanding!